The Kegerator Shell is a shell that is made to hold a matching appliance, like your own outdoor refrigerator. The shell is made with reclaimed wine barrel staves and hoops that have been retired from California wine country. Each Kegerator Shell is made to order so that it matches your own uniquely shaped appliance. 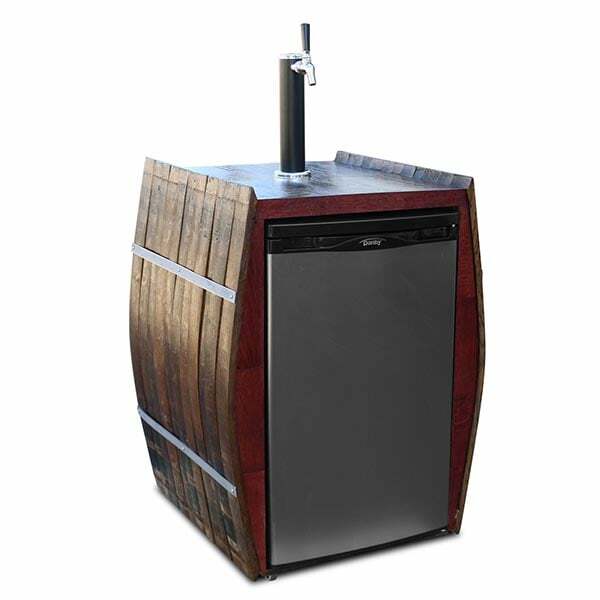 The appliance can be used to hold a keg, or you can use it as a wine refrigerator. The shell makes the keg or the wine refrigerator more elegant. There is an opening at the top to transform the shell into a Kegerator. There is also vent in the back and a full tower system at the top. Vin de Flame will design a unique, refined Kegerator Shell to suit your unique appliance. Bring Napa Valley to your backyard!